Since the first studies of how users read on the web, research shows users typically don’t read very much. Scanning text is an extremely common behavior for higher-literacy users. The chart shows a very rapidly declining curve. 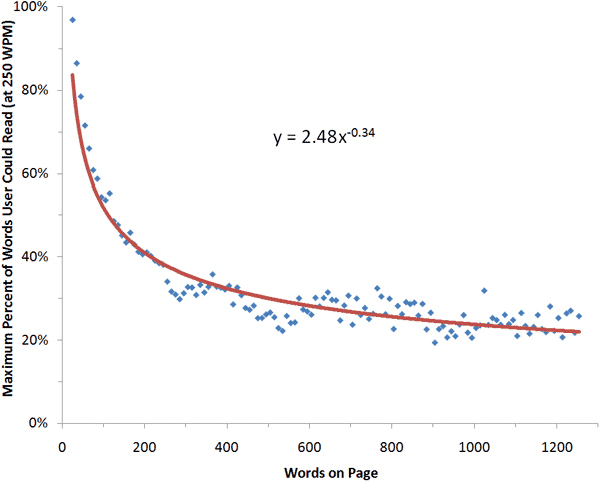 On an average visit, users read half the information only on those pages with 111 words or less. Now go look at your website pages. Are you saying too much? Type less, with great answers so it all gets read. Chart Credit – Harald Weinreich, Hartmut Obendorf, Eelco Herder, and Matthias Mayer: “Not Quite the Average: An Empirical Study of Web Use,” in the ACM Transactions on the Web , vol. 2, no. 1 (February 2008), article #5. Filed under: Being Human, Business Strategy, Digital Marketing, Website Design.